Ingredients: Himalayan salt and organic essential oil of lavender. 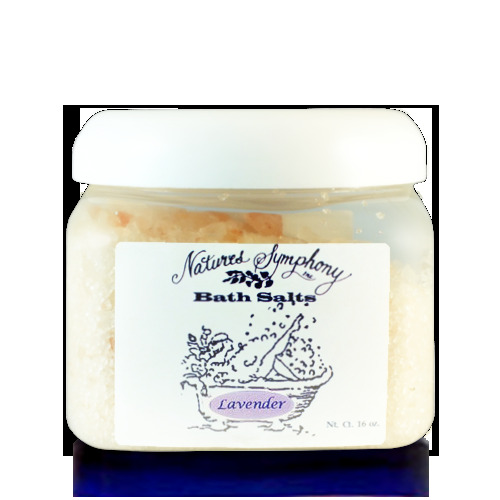 The salts are infused with our most popular Lavender certified pure organic essential oil. The name Lavender comes from the Latin, lavare, which means 'to wash.' Romans added Lavender to their bath water as much for its fresh, herbal, sweet and floral scent, as for its antiseptic quality. Lavender is used in skin care helps for all types of skin, acne, allergies, helpful for sunburn, burns, bruises, blisters and an insect repellant. Helps you to feel more relaxed. During your bath, the aroma of the Lavender essential oil and the contact of the salts and oils with a large area of your body will help relax you, aid in circulation and ease pain. There are 16 ounces in the jar, and we recommend that you use 1 oz. or 1/8 cup per bath in warm water.